It's not often that a theatrical show comes together in a totally innovative and unique way that it sends a shiver of excitement down the spine but could that be the case for The Knot? Dutch-born choreographer Didy Veldman has already gained acclaim for her 2016 production The Happiness Project and now she returns with this modern dance show The Knot. I caught the production early on during its brief UK tour when it was performed at Birmingham Hippodrome's Patrick Centre for DanceXchange. It continues to tour and is next in the Midlands at Malvern Thontres in 1 December. 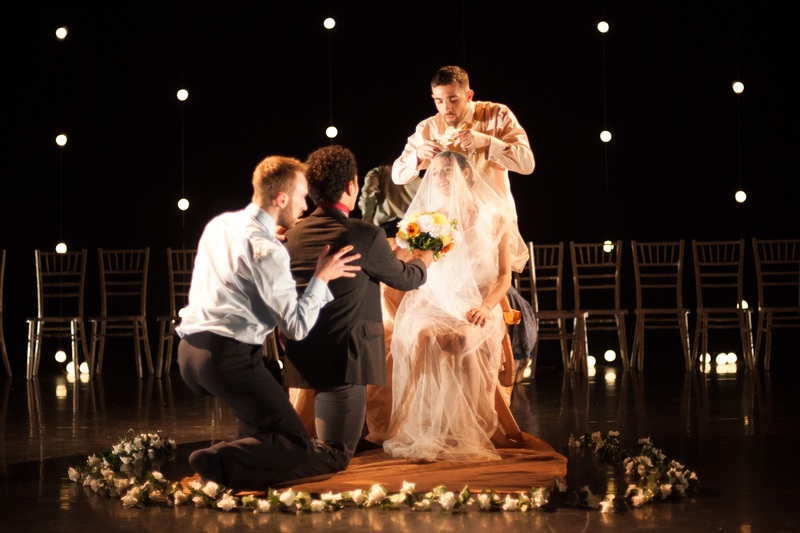 The Knot is a dance exploration around 'tying the knot' with various aspects of what's involved with a marriage and scenes associated with weddings and the guests. Even some of the audience get to be special guests on the big day for an endearing section when a few are pulled on stage. What Veldman does well is bring out the pure emotion of a relationship through inventive and unique dance routines. She also combines a wonderful sense of comedy into the proceedings, particularly the scene where the bride's bouquet is thrown. The use of slow motion is pushed to the edge throughout and no more so than this humorous scene of excitement, aggression and disappointment rolled into one. Even from the opening scene, slow mo is used effectively as men and women get dressed in extraordinarily timed and exact routines. In contrast, there are highly energetic and physical elements of almost breakdance and balancing with chairs. Everything about The Knot feels fresh and exciting. 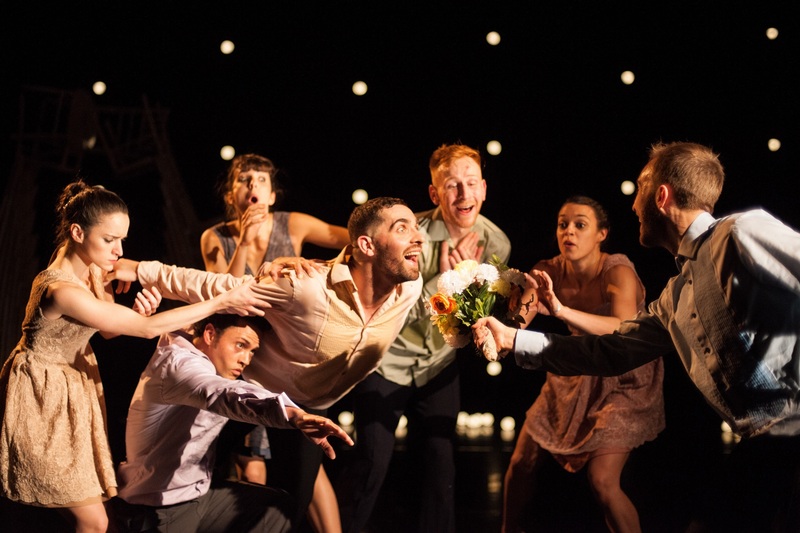 It's so original and emotive as it looks into what a wedding means, how it feels, the role of ritual, doubt, religion and gender through extremely physical and expressive dance. The seven dancers perform to the beguiling notes of Stravinsky's Les Noces, which is music from a Russian folk wedding. Added to this is a specially commissioned score by Ben Foskett in this short but memorable production commissioned by DanceEast (with support from The Arts Council of England, Studio Wayne McGregor and funds from Linbury Trust, The Marina Kleinwort Trust and Beth Krasna). The dancers take turns to express different moods and feelings and there are several remarkable pas du deux, including a symbolic routine where the just married could have a knot tied around their wrists. They then dance while bound together. 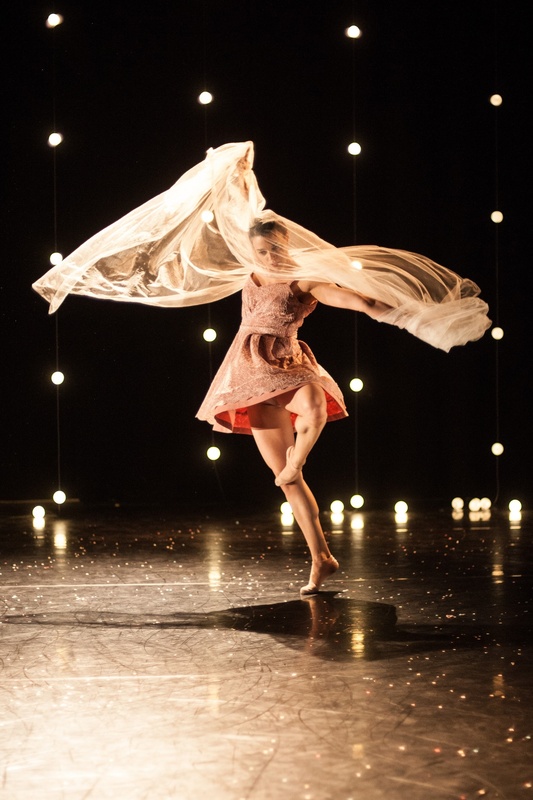 The Knot is one of those dance productions that resonates. It's unique, poignant and something that stands out from the crowd with a marriage of styles, ideas and innovation. It's simply knot to be missed. The Knot will be appearing at Malvern Theatres on Saturday 1 December at 7:45pm.